You know what burns me up about life? That we get old and die, that’s what. I’m ready for eternity right now! I’m ready to go hang out with my Dad some more. I’m NOT ready to go visit his stupid grave. I want to have more fun watching him do his soft shoe routine and hear him grumbling behind the typewriter in a hurry to get his newspaper column out before the deadline. Dad was lively! You know what I mean? Here I just discovered this great singer, Ivie Anderson, bursting with life and youth and exuberance and great chops and I want to go see her and tell her how great she is. But you know where she is? In the ground somewhere. Dust and ashes. 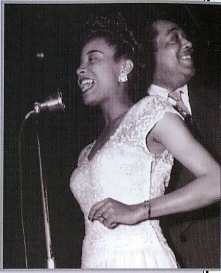 If I tell you she sang lead with Duke Ellington’s orchestra back in the Thirties, you’ll go, “Oh, some boring old singer. Let’s go see The Buggers instead.” And her youth and talent and wonderfulness is invalidated because she’s in the ground and forgotten like dust on my living room floor that I ought to sweep up. I want to go to heaven right now, please! This is not a death wish, by the way. The world is full of cool people I love now. And I’m ready for more adventures. It’s just that I want to hang with Ivie Anderson and my Dad. And my pal Rodney Albin who died of stomach cancer in the Eighties and my brother Noel who turned me on to rhythm and blues before he got smashed at the age of 19. I want us all to be together NOW! This entry was posted in Sorrow of Life by ponderpig. Bookmark the permalink. yes, yes, I agree. Tell me what happened to your brother and how old were you then? I want to go to heaven right now, please! Understandable, but do you really think Duke Ell.’s leading the house band? Not so sure on that, P.
Tho’ Duke & the boys definitely got a shot at headlining the bill in, er, ~(heaven). That said, if some of your corporate atheist neighbors (like…one Joel McKinnon of…New Worlds) had their way, no one would be even allowed to mention the word “heaven”, or any religious language. Instead, they’d replace TS Eliot, or Walker Percy (or even…Ivie Anderson) with…grokkin’ with Sam Harris, or Robert A. Swinelein, ‘Nam hawk, pal of WF Buckley, and social darwinist par exemple. I’m never sure exactly what you’re talking about, but I like it, so keep going! Google “torture”, “Sam Harris,” “neo-con atheist,” and like “fun”, and …well, it might offend you, given your refined literary tastes, P.
I find your SF musick posts somewhat interesting (–especially pre-hippie). The SF jazz scene in 50s-60s was quite happening as well. Cal Tjader’s band packed in ’em for years. Many corporate bay area types of course could care less about jazz, rock, folk, etc. Who needs authentic music when you can invoke da Klassics, like the Blue Danube Waltz, prominently featured in 2001– One of Joel at New Worlds’ faves. Obviously, the pompous noize of the typical Kubrick-corporate spectacle or Star Wars dreck remains a crowdpleaser for the suburbanite scientologist (granted, at times Kubrick chose some decent music–say, the Bartok in the Shining–but on the whole the music was as bombastic as the pretentious, overrated films themselves). I feel the same way. Strange you have expressed how I feel about it. This is the first time I visit your blog but it won’t be the last one. Thanks for the gift of this moment of sharing. Thanks, pal. The thing is to stay close to the heart and tell true what is there. Hope you find more here that speaks to you.